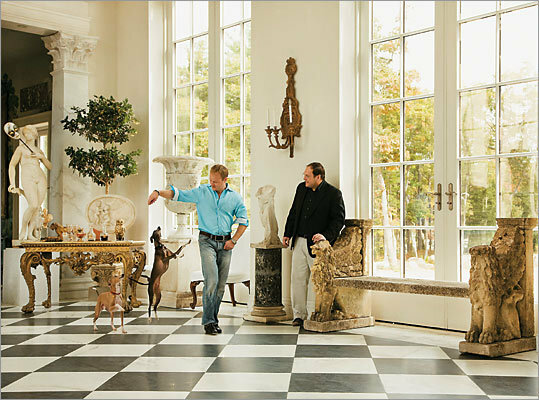 Over 20 years in the making, Tom Lang's and Alexander Westerhoff's grand estate is a throwback to the (more recent) Gilded Age. When Tom Lang used to doodle in the margins of his pre-med notebooks, instead of working to form the graceful lines of an aorta, he found himself sketching an idyllic villa with 20-foot-high doors, soaring ceilings, lots of statues, and a large central entertaining space with checkerboard tile floors. Some time after he met Alexander Westerhoff in 1988, they discovered that Westerhoff used to do the same thing -- and the sketches were nearly identical. The couple have been happily married since 2004. Lang, 45, who chose not to pursue a career in medicine, ended up working in advertising in Boston until 1992, when Westerhoff, now 39, an antiques collector, persuaded his partner to join him in business full time. Last year, they moved Alexander Westerhoff Antiques, a spectacular stew of marble, crystal, and antique wood treasures, into a converted historic church in downtown Essex. And they finally built that dream house, which is a 7,000-square-foot villa in Manchester-by-the-Sea. They named it Solitude, after the castle of the infamous Karl Eugen, a German duke who entertained his mistresses in the aptly nicknamed "pleasure palace." Says Lang: "The town where he lived was filled with redheaded children, and that's how everyone knew who was seeing the duke." To say that the North Shore home's design is over the top is, well, an understatement, but the partners pull the Gatsby-worthy space together perfectly with bold flourishes and storied antiques. Paintings, sculptures, and furnishings have come from estate sales all over the country; they were collecting for the home long before they broke ground. "We designed and dreamed up this home from the inside out," says Lang. It embodies all of the characteristics that Lang and Westerhoff wanted if it were a countryside European villa. "We didn't build our house to impress," says Lang. "We chose this style because we don't feel comfortable in anything else." The home's centerpiece is the fully enclosed "loggia," an enormous entertaining room modeled after the great open porticos common in houses in Europe. During dinner parties, the room can be transformed into a massive dining hall, complete with a 30-foot-long table. In the living room, the 18th-century fireplace came from Doris Duke's former home in Newport, Rhode Island, and the painted wall panels were recovered from the Beekman family mansion in Manhattan. Outside the powder room are wall plaques from Pompeii, and in the dining room is a chandelier that once belonged to Henry Ford. They controlled the costs -- as much is possible in a home this grand -- by buying smart and decorating themselves. For example, all of the black and white marble tiles in the loggia came out of the old lavatories at South Station in Boston and cost all of $250. They also saved by working with a contractor, Alex Filias of Filias Construction, rather than an expensive architect. He built the home from the couple's pencil sketches. To fit their romantic vision of everyday life at the villa, the couple had a few 20-foot-high front doors installed in the loggia, which was supposed to function as the main entryway -- "This is how crazy we are!" says Lang. The doors being a tad impractical, especially with New England's howling winter winds, they use a smaller side door for everyday use. But the oversized doors are evidence of how playful Lang and Westerhoff are. Lang mentions that the loggia ceilings are so tall that he can imagine flying around under them. And then there are the secret passageways -- they installed one outside the powder room and one outside the guest bedroom. Both look like part of a wall, but when you lean into them, they open. Their home is quite a contrast from the 1,100-square-foot Manchester house they moved from, a jewel box of a cottage that they had brought back to life. But, Lang says, it's the new house that "allows us to be creative and honor our friends." At the villa, they held a friend's wedding and hosted a fund-raiser for Deval Patrick. At their "Doctor Zhivago" party, Russian sopranos from the Boston Lyric Opera entertained guests who had donned tuxedos and tiaras. "We heard that a big snowstorm was coming, and we thought that having a party would be wonderful," says Lang. "So we had a piano brought in and then frosted the windows to add atmosphere. It was like being in Moscow in 1916." They consider the home a work in progress: A 150-foot wading pool will soon serve as the focal point from the loggia and a new guest wing is beginning to climb the side of the house. "This is our dream house, and for us the dream doesn't end," says Lang. "It will constantly be creating itself. And, for us, thinking there is more to come is part of it."